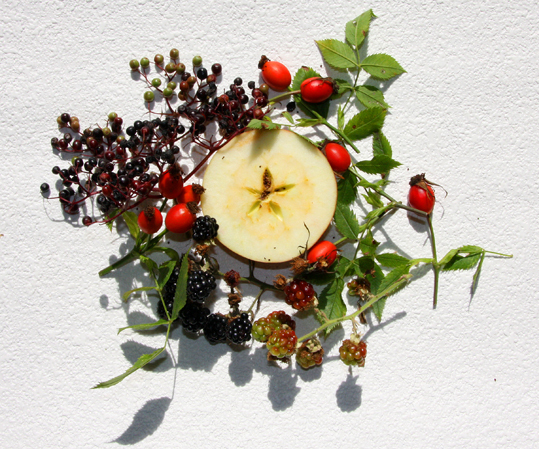 I've been creating a mandala each month with things from my own garden - and this month is an edible mandala as August is so much the time for picking all sorts of fruit including blackberries, apples and elderberries. My aunt always used to make a lovely rosehip jelly at this time of year too, but sadly I never got her recipe. I did, however, cook and eat the fruit in the picture - except the unripe berries - with some yoghurt for my tea. It was very nice too. As you can see, for the mandala I cut the apple in half to reveal the star in the middle.